Michael Herzog, the 2010 and 2012 Minnesota PGA Section Player Development Award winner, 2015 Dakota PGA Chapter Youth Player Development Award winner, a 2016 U.S. Kids Golf Top 50 teacher, and is the Operations Manager and PGA Director of Instruction for Golf Etc. 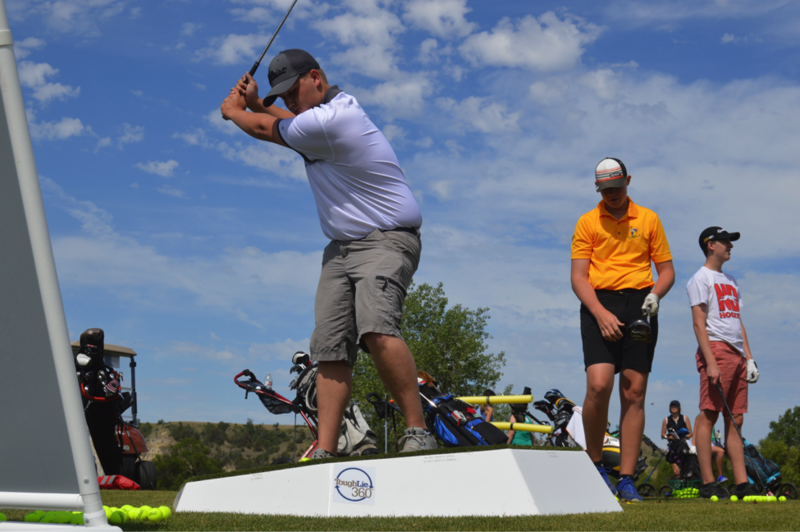 – Bismarck in Bismarck, North Dakota, speaks about engaging juniors with uneven lies on the ToughLie 360. My purpose in the golf industry is to help grow the game. For me, there’s no better way to do that than through working with kids. The ToughLie 360 has helped me engage and develop young golfers in lessons and uneven lies. Having invested in the product, I wanted to make sure our clients see it, feel it, and try it. So, I set up the ToughLie 360 in the center of the golf shop. This forces every person to step over the product, and more often than not they ask me what this intriguing contraption is. The feedback has been overwhelmingly positive once we get them on it. I find ToughLie 360 to be an excellent tool for junior golf. We use it in our junior clinics, lessons, and PGA Junior League practices. This product allows us to create fun challenges for our golfers. We can add variety to our practices by having juniors hit towards targets from eight different lies. No longer are they simply hitting 7 irons from an even lie. Now we can practice a 5 iron punch shot on a downhill lie, followed by a wedge from a sidehill lie. This truly adds purpose to our practices. It’s also an educational tool as we can test kids on the various ways that an uneven lie or uneven lies impacts ball flight. Through practicing on the ToughLie 360 our juniors develop confidence, consistency and a fundamental understanding of uneven lies. When we take the kids on the course and they face uneven lies, we are able to relate the situation back to what they practiced on the range. The kids recognize that there is purpose to their practice as they are preparing in a way that is authentic to the experience they face on the course. Coincidentally, we are leading our division in PGA Junior League. Now I can’t attribute this completely to the ToughLie 360, but I genuinely believe that it has contributed to our recent success. At the end of the day, my goal is to make it fun for the kids. I want to keep them driven, motivated and engaged. There are many ways for me to do achieve that, but the ToughLie 360 is an invaluable tool that supports my mission of growing the game.